Runaway’s Copic® Tower provides a clear message about how much we value these wonderfully versatile art markers. Runaway offers a full range of Copic® Sketch Markers at Runaway’s discount price of just $5.50 each, and we offer the Ciao Markers at just $3.80 each. We also carry the Copic® Multiliners at $8.00 for the refillable pens and $4.00 for the disposable (which we carry in a range of colors). 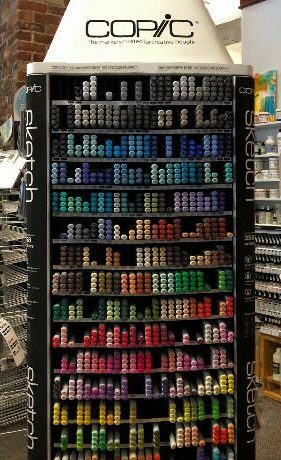 And you can also find Copic® paper, nibs and refill containers ($7.00) for the various pens and markers, as well as Copic® instructional books. And Runaway offers a “refill bar,” where you can get your markers refilled for just $1.75 each (you may need to leave them with us for a bit, depending on how many you have and how busy the store is). Oh, and did we mention we teach classes in how to get the best use out of your pens, beginning with Runaway’s Beginning Copic® class? Runaway Art & Craft Studio is definitely your “one stop” Copic® destination.